It’s coming down to the wire over here. I have three days to finish (well, start) my holiday baking. 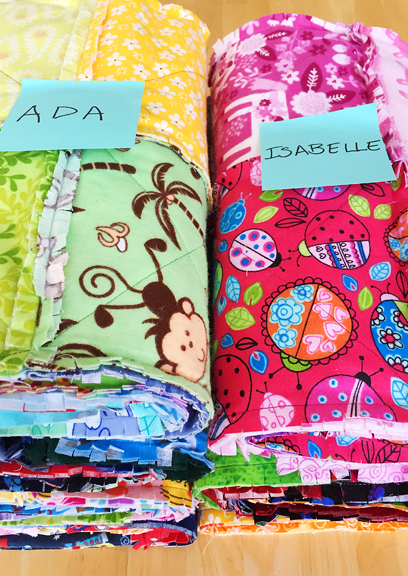 You might think that I should have a lot of extra time since there’s very very very little snow to ski in these parts, but there were these flannel rag quilts I was sewing… nine flannel rag quilts. That took a big chunk of the last two weeks. 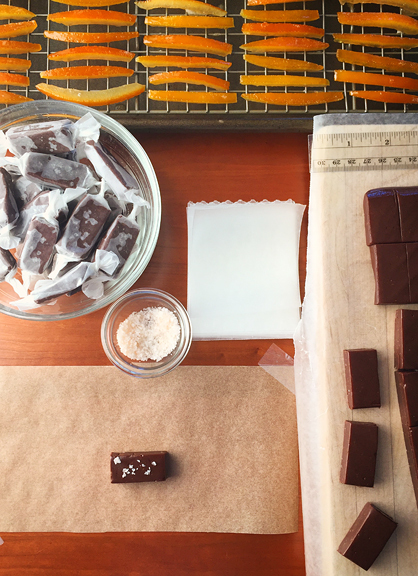 I should clarify that while I haven’t begun my holiday baking, I have most of my holiday candymaking completed. Variety is the spice of life and all that good stuff. Life is a bit of a frenzy right now, but I did take a few hours off recently to see a rare visitor to Colorado. Deb, of Smitten Kitchen (my favorite food blog), came through Boulder last week on her book tour. While I couldn’t make the actual event, we were able to finally meet in person over some noshes before her book signing. Despite being up to my armpits in chocolate, butter, sugar, cream, and flour, my mind has actually been puzzling over our upcoming holiday menu. Typically we ski our brains out on Christmas morning and I’m too wiped out to prepare anything more than a simple (but delicious) meal. Looking at the short-term forecast, our brains may very well remain securely in our heads due to the lack of snow. Even so, I still don’t want to spend a ton of time cooking. I know Jeremy would be delighted with a sous vide steak, some potatoes, and lots of greens. 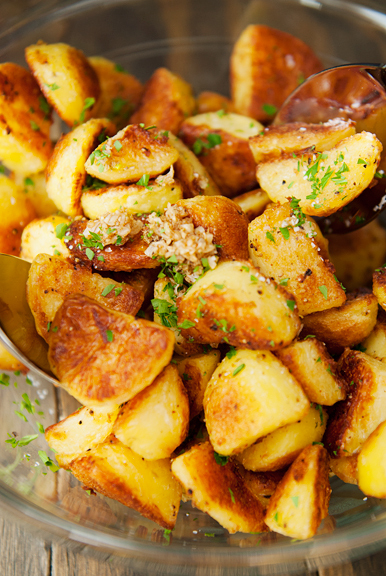 We have a new favorite way to enjoy roasted potatoes, too. It’s unclear to me how I found Kenji’s recipe or who turned me on to it (it may have been Kenji’s Instagram), but when I see the words “Best Roast Potatoes” coming from a trusted source, the logical next step is to try it out. I’ve made the potatoes a couple of times now – the first time with olive oil and the second time with duck fat. The olive oil version was good, but holy moly the duck fat version is the stuff of dreams. Kenji’s technique basically parboils potatoes in an alkaline environment to create a roughed starchy exterior, tosses them with fat, and roasts the potatoes to yield crisp outer crusts with fluffy interiors. The potatoes simmer until they are fork tender, which takes ten or so minutes. During that time, you can prepare your fat (olive oil, duck fat, beef fat) by heating it with minced garlic until the garlic turns golden. You don’t want to burn the garlic, just lightly brown it. Agitate the pan constantly to prevent the garlic from burning and then strain it just as the garlic takes on some color. 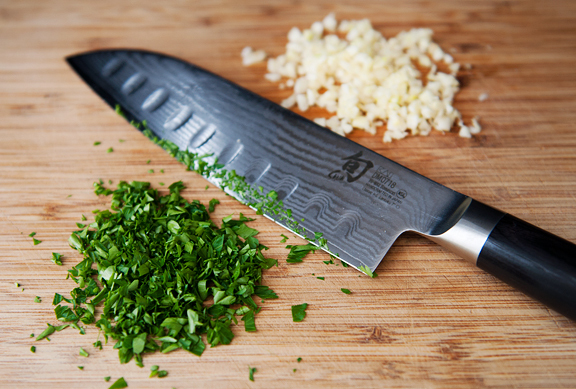 Keep both the fat and the garlic. Kenji adds rosemary and pepper to his oil, but I like it better without rosemary. Go with your own preferences. 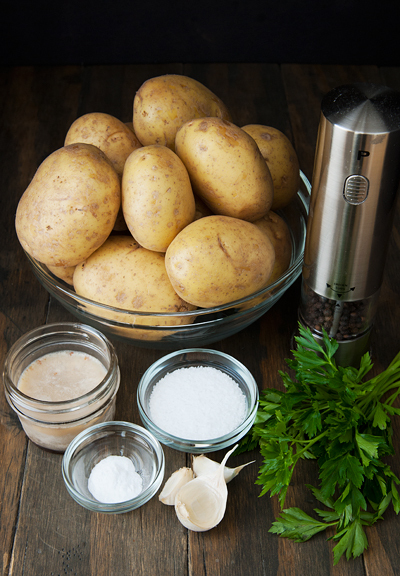 Once the potatoes are ready, drain the potatoes and let them hang out in the hot pot for 30 seconds to promote evaporation of any excess moisture in the potatoes. 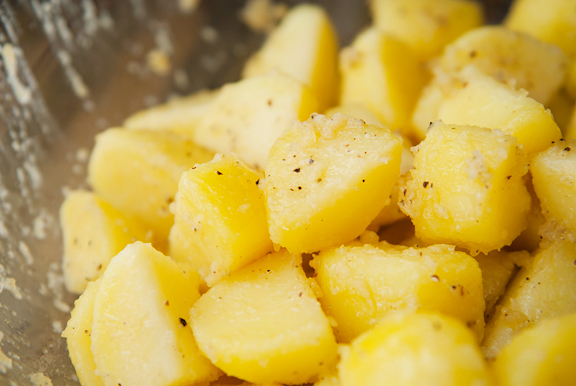 Place the potatoes in a large bowl and toss with the hot oil and salt and pepper. This tossing is the step that generates that roughed starchy exterior, so don’t be too gentle! 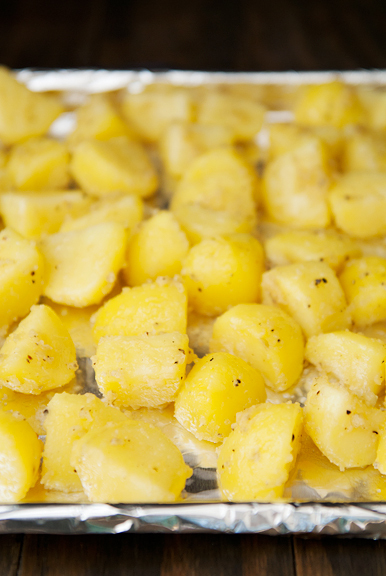 Spread the potatoes out on a pan and roast, turning the potatoes to get an even crisping. When the potatoes are done, toss them with the reserved browned garlic and parsley and any additional seasoning. These really are the best roasted potatoes I’ve ever had. The crunch of the outer layer in contrast to a delicate, fluffy interior is heaven. In addition to the perfect texture combination, the flavor is excellent thanks in large part to 1) yukon gold potatoes (my favorite) 2) duck fat and 3) garlic. 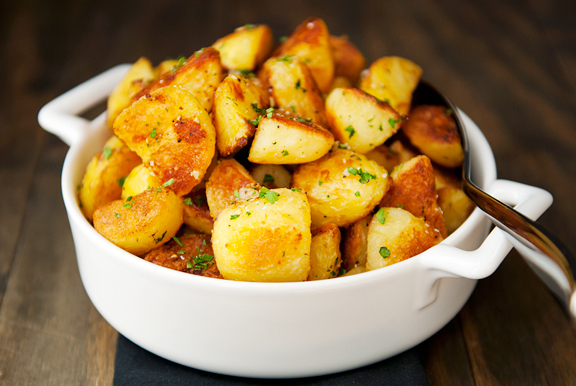 There is everything right with these potatoes. Preheat oven to 450°F. Bring 2 quarts of water to a boil in a large pot. 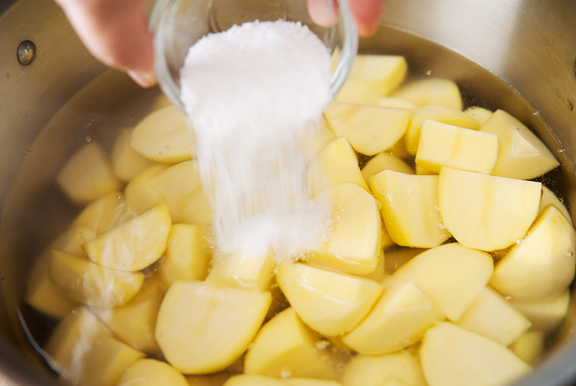 Stir in 2 tablespoons of kosher salt, the baking soda, and the potatoes. Let the water return to a boil, then reduce the heat to a simmer. Cook the potatoes for about 10 minutes until fork tender. While the potatoes cook, set a strainer over a small bowl. 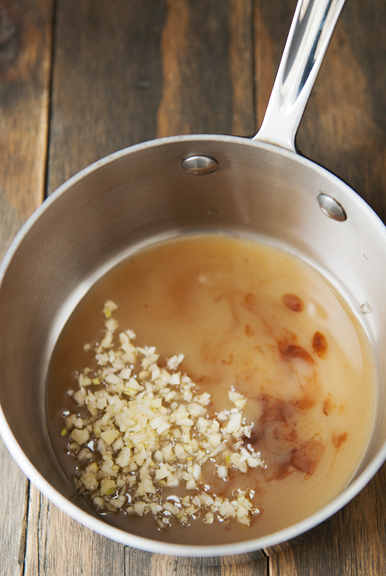 Place the fat and garlic in a small saucepan over medium heat. Constantly agitate the pan to keep the garlic from burning until it just turns golden (about 3 minutes). 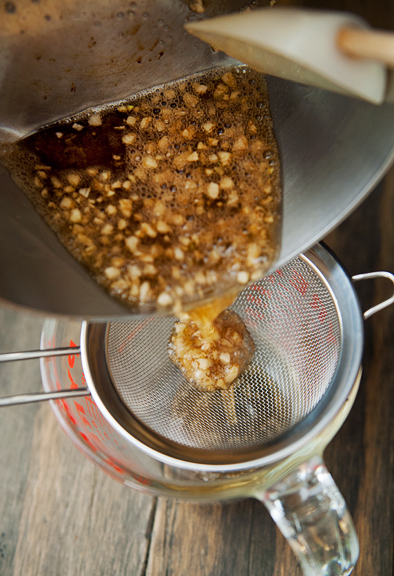 Pour the fat through the strainer, reserving the solids. 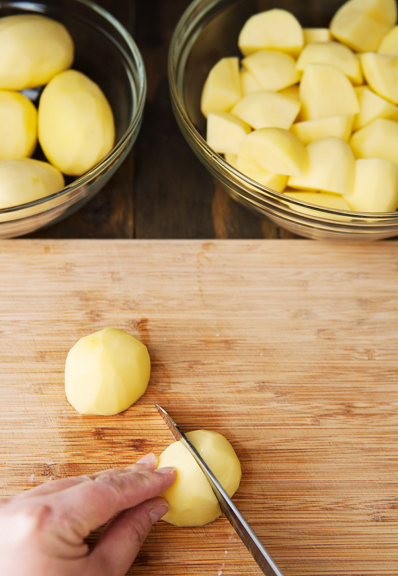 When the potatoes are ready, drain them and return the potatoes to the pot to dry for 30 seconds. 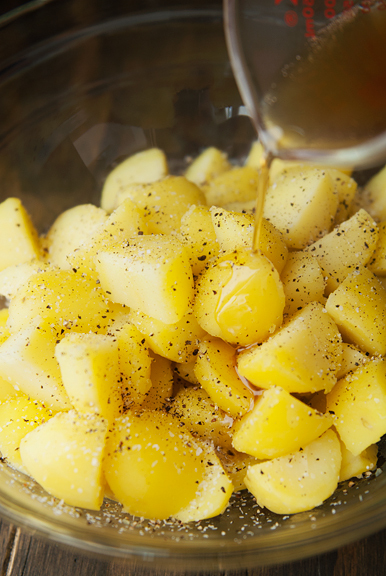 Empty the potatoes into a large bowl and toss with the hot oil, salt, and pepper. Keep tossing until a shaggy layer of mashed potatoes coats each piece. 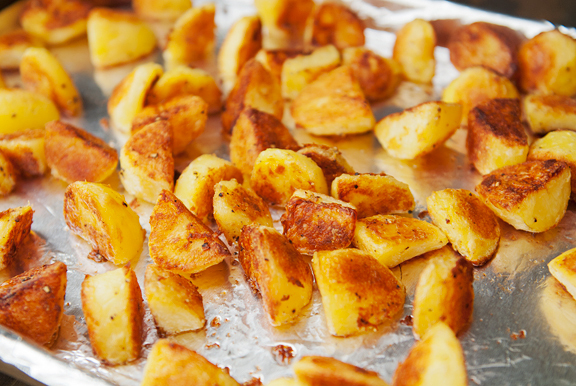 Line a rimmed baking sheet with foil and spread the potatoes evenly in a single layer over the baking sheet. Roast for 20 minutes. 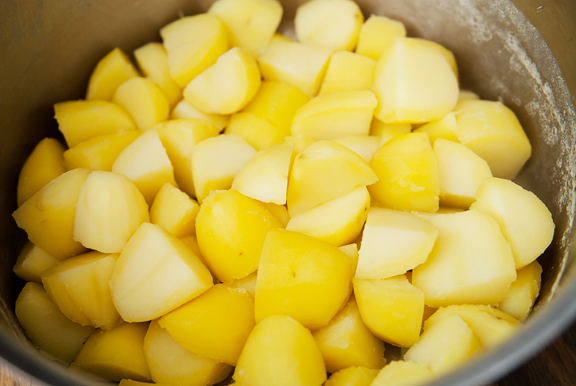 Turn the potatoes and cook another 30-40 minutes, turning occasionally for even crisping. 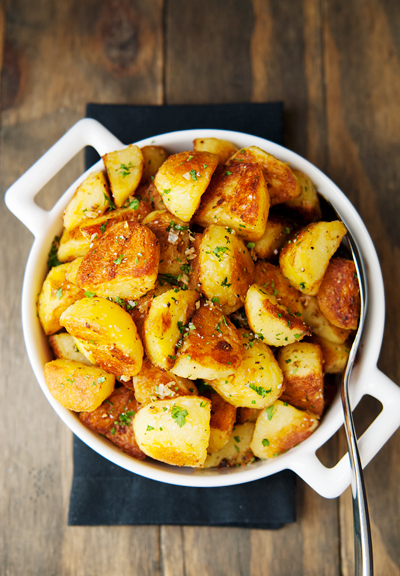 Toss the potatoes with the reserved garlic, parsley, salt, and pepper. Serves 6-8. Yay! So happy that my comment reminded you of Deb’s imminent arrival in CO! And here I thought you two had probably had that visit planned for ages. So glad you were able to get together. I could’ve listened to her all night. Just thinking about the two of you together makes me smile, giggle, and drool thinking about all of your delicious food I have made. These potatoes look great. I am going to forward them to a friend who might still have some duck fat hanging around. P.S. I hope you get some unexpected snow before Christmas. You and Deb in the same place makes me happy. You two are the only food blogs I read. Count me in with Jillian. The thought of you and Deb Perelman meeting and noshing together makes me happy. Also count me among the Colorado Front Range folk planning on a “brown” Christmas. Planning to cook beef this year which is a departure for our family. 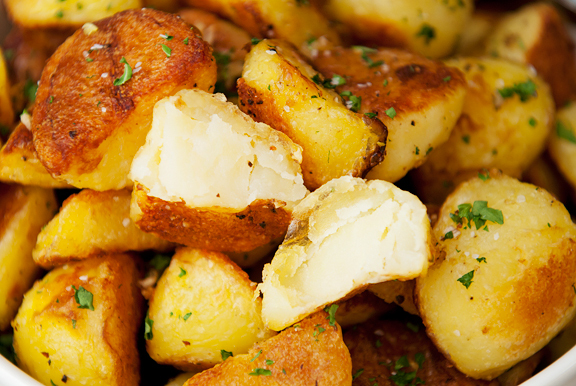 I think these roasted potatoes may make their way onto our menu. Oh, these look so delicious! I’m definitely going to have them on my Christmas menu!! Hope you have a white Christmas! I adore her I adore you I adore this SO much . Best post ever. OK, off to buy some Yukon Golds and duck fat. This recipe is all me. So glad you got to see Deb. I went to the event, which was PACKED, and she was a total delight. Can’t wait to try that potato recipe. Where do you get duck fat? I had to look up flannel rag quilts and guess who’s blog came up in the featured snippet block at the top of the google search results page?! :) Hey you! So stoked to discover another of your blogs and uh, I guess, learn about quilting? The quilts are so crazy colorful, it makes me happy just to look at them! Too funny, just got done at Smitten Kitchen and slid over to Use real Butter….and there’s Deb P! 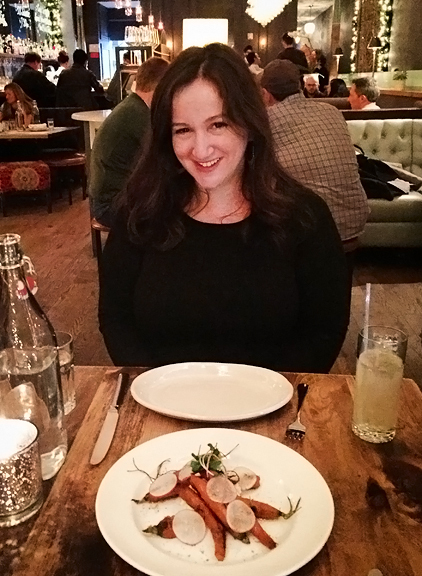 I love the thought of you and Deb Perelman getting together – two of my favorite food bloggers! it could only have been better, in my mind, if Julie van Rosendaal of dinnerwithjulie had been there, too. The three of you have such good recipes and a joy and curiosity about cooking. Plus you’re each so warm and personal, and give me such a strong sense of the different places you each live. Kristin – Yep, I am terrible about keeping abreast of what others are up to unless they tell me specifically ;) Deb is a delight. And yeah, now I need to find myself some more duck fat!! Thanks for the snow wishes, looks like we MIGHT get some at the end of this week?!?! Fingers crossed! Diana – Thank you, dear! It looks like we might get one just in time :) Happy holidays to you! You just lived out the fantasy I had in my head prior to Deb coming to Minneapolis. I totally though, “oh yeah, I’ll play it cool and maybe Deb will come and grab a bite to eat with me.” Ha! So glad you two had a wonderful time! I’m definitely in the same boat as Jillian above, yours and Deb’s are the only blogs I follow religiously!